While acne is often considered a problem for teenagers, people of any age can experience acne symptoms. This usually occurs when your skin produces excess sebum, leading to clogged pores and outbreaks of pimples. 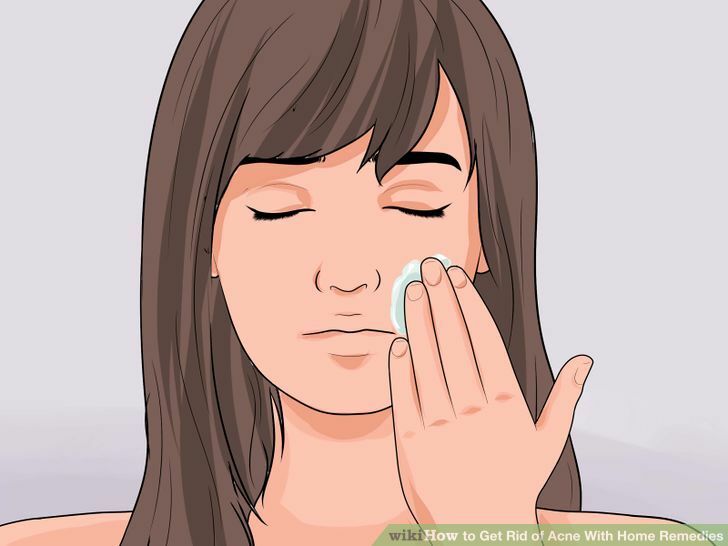 Although your dermatologist can probably offer the best treatment for your acne, there are a number of home remedies that can help as well. You can use these remedies as a supplement to the regimen suggested by your dermatologist. If you’re experiencing acne for the first time, click here. If you’re struggling with severe or cystic acne, click here. Select the right cleanser. You’ll want a gentle face wash that is non-abrasive. Make sure that any product you use is free of alcohol to prevent further skin irritation. If you’re unsure of what the best cleanser for you would be, ask your dermatologist for a recommendation. Wet your face with lukewarm water. Cold water will close up your pores. 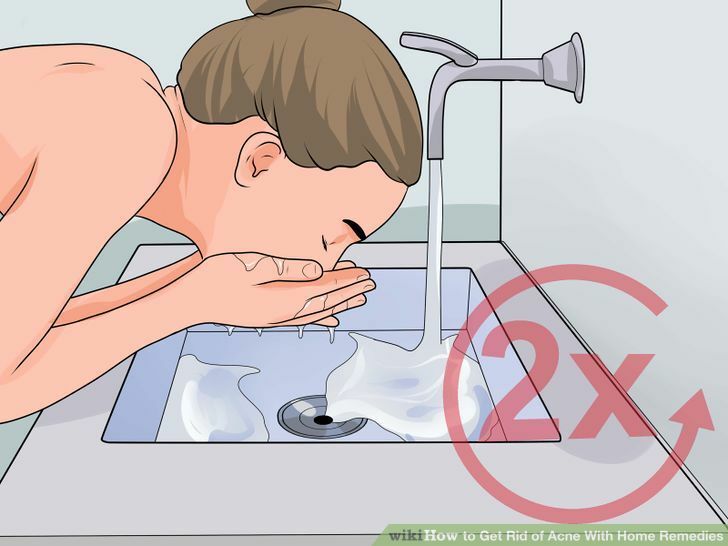 While washing your face, you’ll want your pores open so dirt, oil, and bacteria will flow out of your skin. Apply the cleanser to your face. Be sure to only use your fingertips when applying the cleanser. 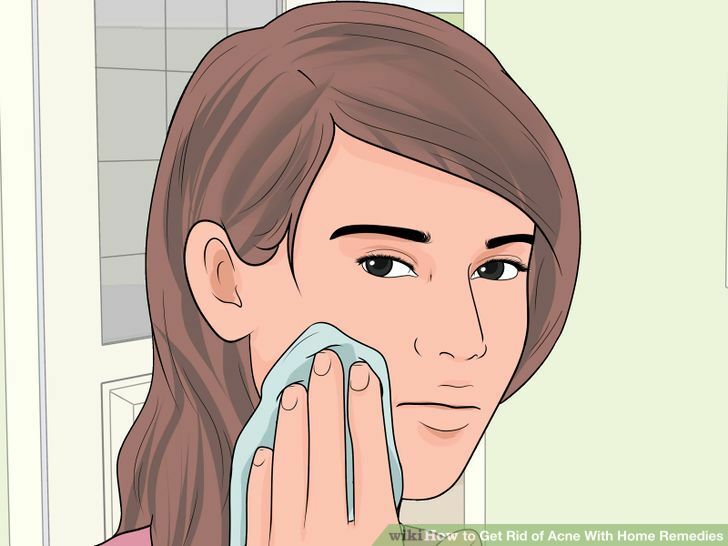 A washcloth or sponge will irritate your skin. Do not scrub your skin while washing your face. This will also irritate your face. Just apply the cleanser and allow it to sit for a minute or so. Rinse with lukewarm water. Again, make sure to use warm water to keep the pores open and allow dirt and bacteria to flow out of your skin. Pat your skin dry with a clean towel. Do not rub your face with the towel. This can irritate your skin. Rubbing will also spread around bacteria and dirt, making your acne worse. Instead, just gently pat your face with the towel. Apply a moisturizer if necessary. While many people with acne would avoid moisturizers, your skin still needs moisture to stay healthy. Washing your face can lead to dryness. If you notice redness, burning, or itching, your skin may be dried out. Gently apply an oil-free moisturizer with your fingertips to help fight dryness after washing. Limit washing to twice a day, or after sweating. While it may seem like more washing would be better for your acne, this isn’t true. Washing too much will strip your skin of essential oils, which will dry out your skin and can even lead to premature aging. Repeat these steps only twice a day, morning and night. You should also wash your skin after sweating, since this can lead to breakouts. 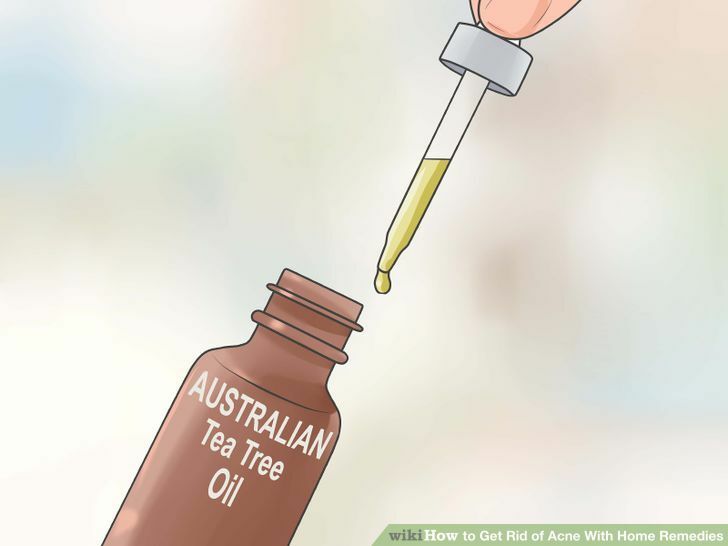 Use Australian tea tree oil. Tea tree oil is a pleasant-smelling essential oil derived from a tree native to Australia. There is clinical evidence that tea tree oil is effective against several skin conditions, including acne. It works as a natural astringent and can stimulate the immune system, making it an asset for your fight against acne. 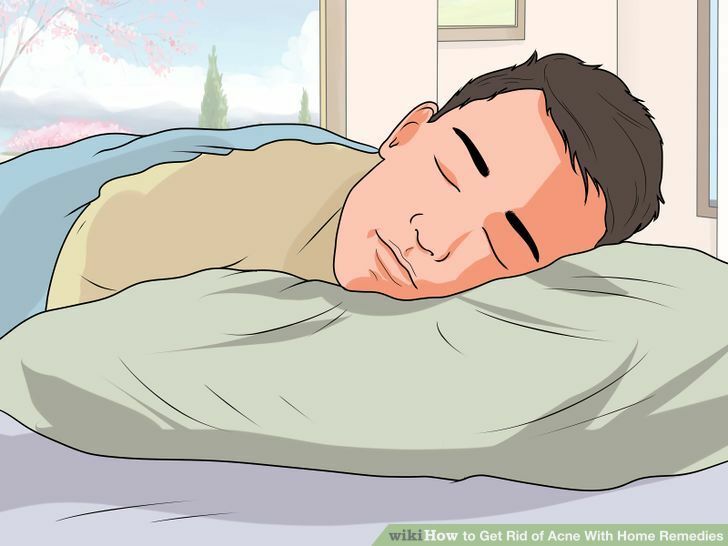 See How to apply for detailed instructions on how to use and apply tea tree oil. Some people may be allergic to tea tree oil. Before using it on your face, test a drop of tea tree oil elsewhere, like your arm or leg. Wait several hours. If a rash develops, you may be allergic or sensitive to the oil, and should avoid putting it on your face. Tea tree oil is toxic when consumed. Do not ingest tea tree oil. Use lemon juice on pimples. Lemon juice works as a natural disinfectant, which will kill bacteria that cause acne. It can also stimulate circulation to the skin, which will bring essential nutrients from your body to help fight acne. 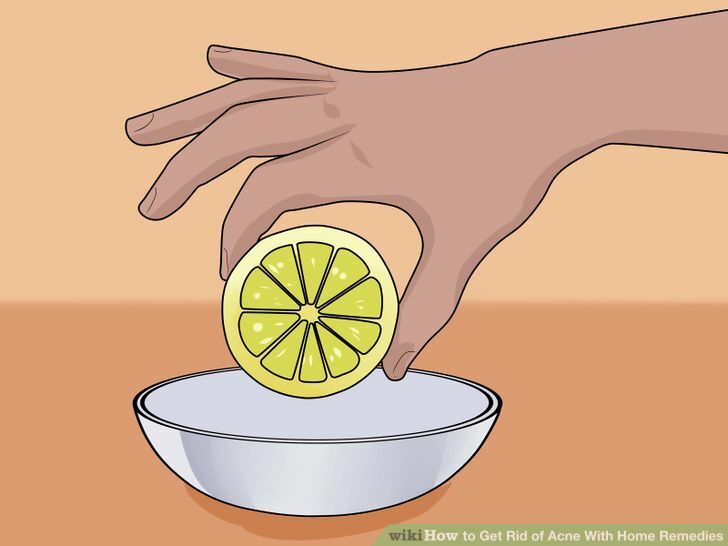 Follow these instructions to treat your acne with lemon juice. Squeeze a large lemon into a bowl until you have about 2 teaspoons. Note that you may need to use a second lemon. Make sure to get the lemon juice by squeezing lemons instead of using store-bought juice- this usually contains preservatives that can irritate your face. Use a cotton ball or Q-tip to apply the lemon juice to each one of your pimples. If you do this treatment during the day, leave the juice on for at least 30 minutes, then rinse with cool water. If you are doing it at night, leave it on while you sleep, then wash it off with cool water in the morning. Make sure you’ve removed the juice before going into the sun, as this can have a bleaching affect on your skin. Experiment with honey. Although there is conflicting evidence, some consider honey an effective treatment for acne because of its antibacterial properties. Advocates consider Manuka honey, harvested from New Zealand, and raw honey, to be the two best forms of honey for acne treatment. Both are available in health food stores and on the internet. 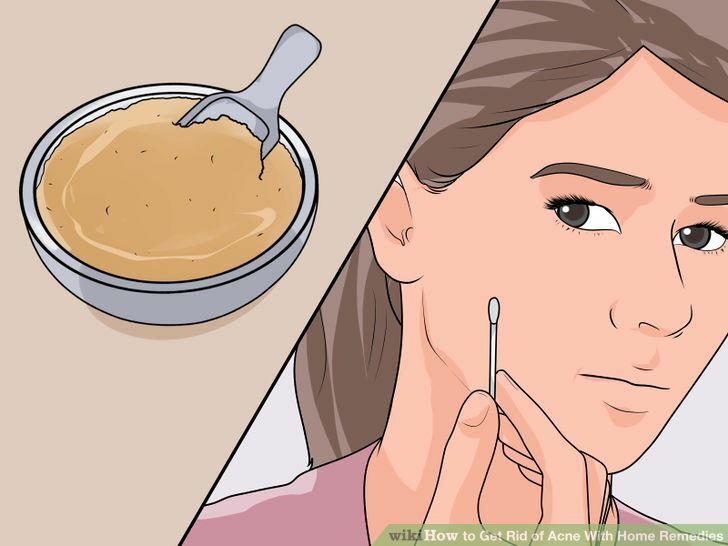 Before applying honey to your acne, dab a small amount around your jawline. Wait about 30 minutes to see if you have an adverse reaction. 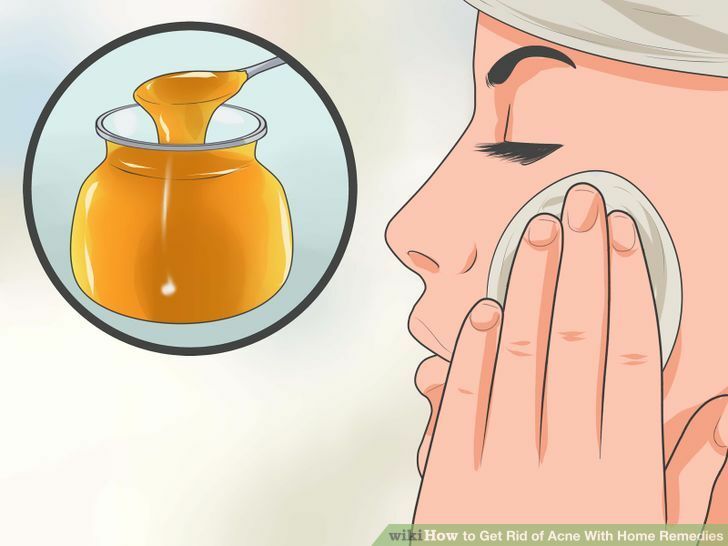 If so, do not apply honey to your acne. You may use honey in two ways. Either dab your pimples, or apply the honey to your whole face like a mask. Wash off the honey with cool water after 30 minutes, though you may leave it on longer if you want. You could also add about 1/2 teaspoon of cinnamon to your honey. This adds to its antibacterial properties and can promote circulation in your face. Mix up an apple cider vinegar toner. Apple cider vinegar helps to balance your skin’s pH, leading to less blemishes and a more even tone. It also kills bacteria and can soften your skin. It is very simple to mix up a toner from apple cider vinegar. Thoroughly clean a glass bottle to store your toner in. Use only hot water and soap. Cleaning with alcohol or bleach could leave chemical residue in the container, which can then get on your face. Pour 1/2 cup of apple cider vinegar and 1/2 cup of water into the container. Cover the bottle and shake to mix the ingredients well. 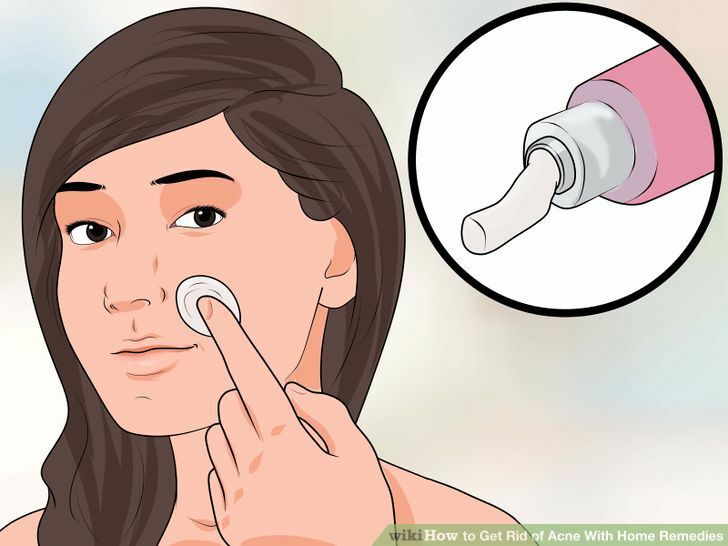 Apply the toner to pimples using a cotton ball. Store the mixture in a cool, dry, dark place. You could try applying apple cider vinegar to your skin without diluting it, but this is not recommended. The apple cider vinegar is harsh and can cause irritation if not diluted. If this mixture causes any irritation, try diluting with more water. Mix a turmeric treatment. This yellow-tinged spice, common in Middle-Eastern cooking, is available wherever spices are found. 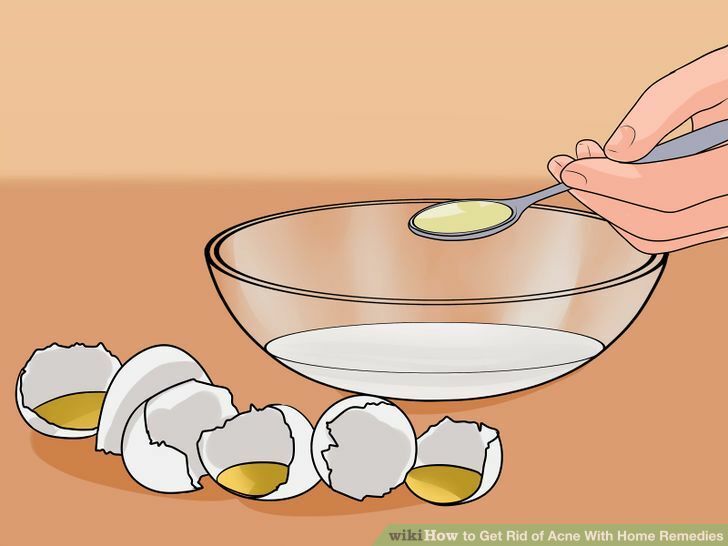 It is usually considered an effective home remedy for acne. Follow these simple steps to mix your own turmeric paste and treat your acne. Add 1/4 teaspoon of powdered turmeric to 2 teaspoons of coconut oil. Stir the mixture well. Spread the mixture evenly on your face. Let the mixture sit 15 minutes. Then rinse with cool water. Remember that turmeric stains your skin yellow, especially if you leave it on overnight. For advice on how to get rid of turmeric stains, look here. Rub tomatoes on your acne. Naturally rich in antioxidants and vitamins A and C, tomatoes are another simple acne remedy available at any food store. Tomatoes also tighten the skin’s pores and shrink pimples. Application is easy and takes very little time. Slice a small tomato in half. 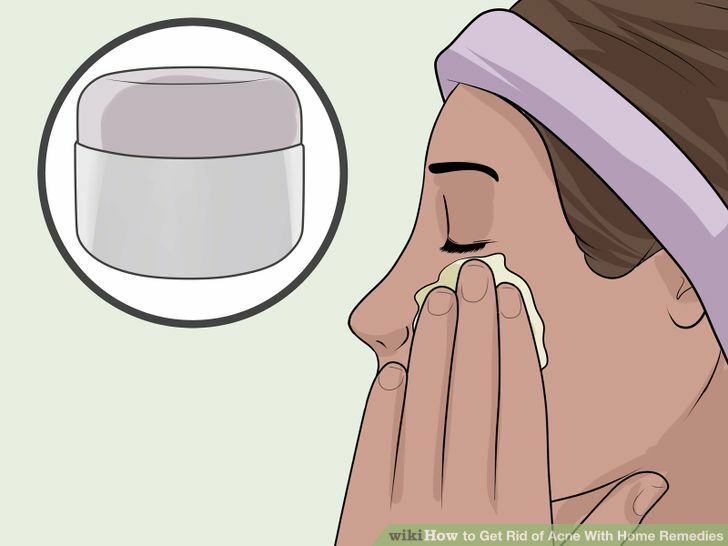 Rub the opened half over areas of the skin where acne is present. Discard the tomato afterward. Massage the juice into your skin for a few seconds. 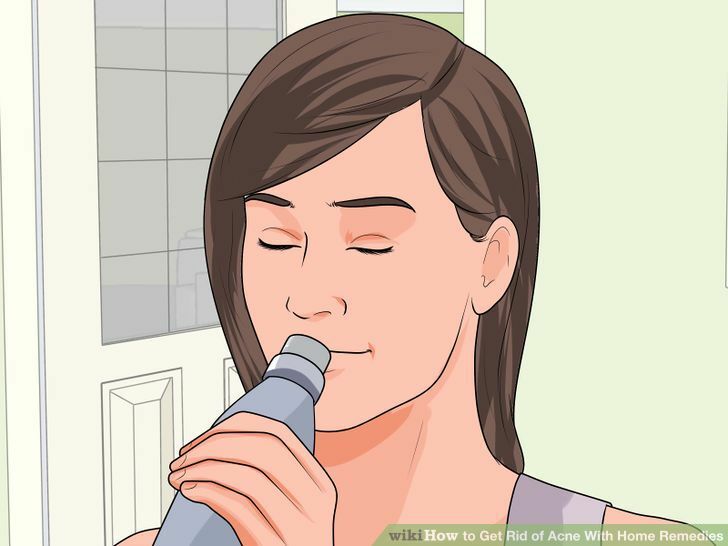 Rinse your face with warm water afterward. 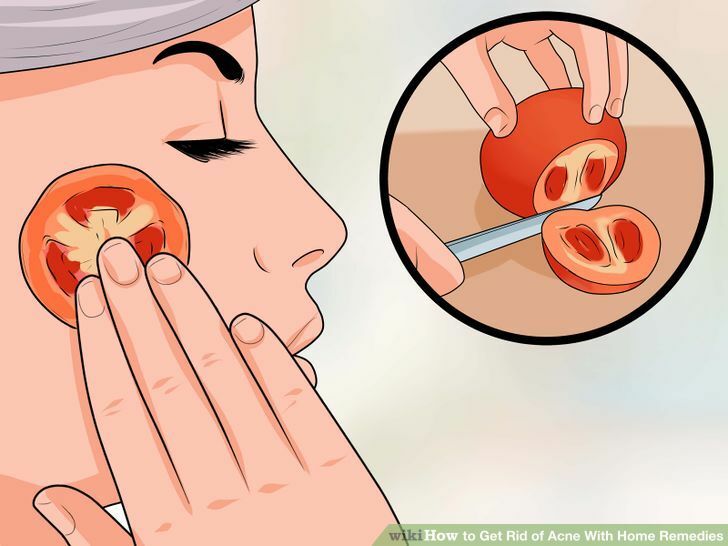 Apply twice a day for best results, using the other half of the tomato for the second application. Make a sea salt mixture. Sea salt can help dry out your pimples and absorb excess oil. 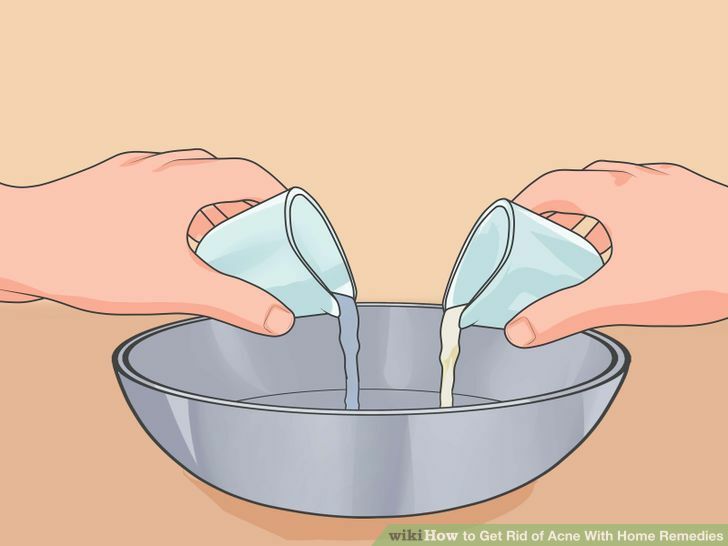 Mixed with honey, it can be an effective home remedy for acne. Mix 1 teaspoon of sea salt with 3 teaspoons of hot water. Apply this mixture to your face when it has sufficiently cooled. If you only want it on your pimples, you can use a Q-tip to apply it as a spot treatment. Leave the mixture on for 10 minutes. Avoid keeping it on any longer or your skin will get too dry. Apply moisturizer. Sea salt may leave your skin dry, so applying a moisturizer is important to keep your skin healthy. Use an egg white mask. Egg whites can help tighten the skin’s surface and reduce the size of pores. They also fight discoloration associated with acne. Wash your face using the steps from Part 1, except don’t moisturize yet. Crack 3 eggs and separate the yolks from the whites. Add one tablespoon lemon juice if desired. This addition can help loosen blackheads and whiteheads. Whisk the egg whites until they become a foam. Apply this evenly to your face and leave on for 15 minutes. Rinse off with warm water and pat your face dry with a towel. Apply a yogurt mask to your face. Yogurt helps open up pores, exfoliate the skin, and absorb excess oil. 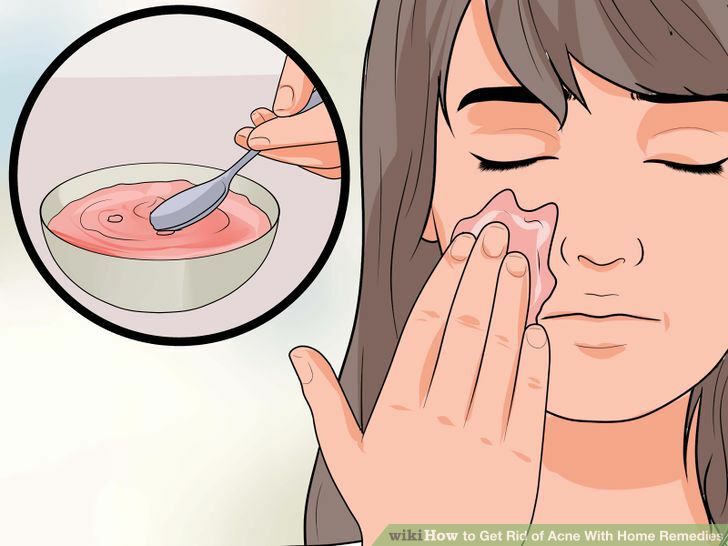 Take one tablespoon of plain yogurt and apply it evenly across your face. Leave this on for 15 minutes, then rinse off with cool water. You can repeat this treatment daily. Apply baking soda to your pimples. Baking soda can help balance your skin’s pH level and absorb excess oil. It can dry out pimples, causing them to shrink and eventually disappear. Mixing up a baking soda paste is simple. Mix 2 tablespoons of baking soda with a few drops of water. Stir this mixture until it forms a paste. Apply this paste to areas of your skin affected by acne. Let the mixture sit for 15 to 20 minutes, then rinse it off with lukewarm water. 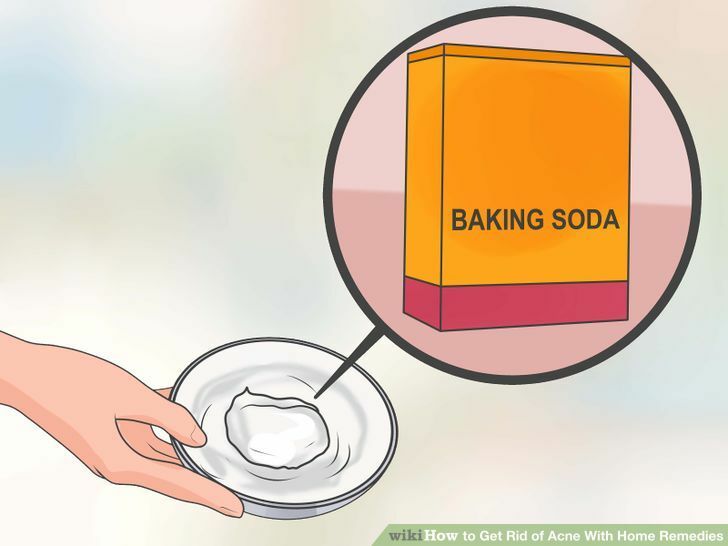 Apply a moisturizer to your face, since baking soda can dry out your skin. Before using this treatment, apply a small amount to your jawline or another area on your face. Wait a few minutes and see if you have an adverse reaction. If so, don’t continue using it. 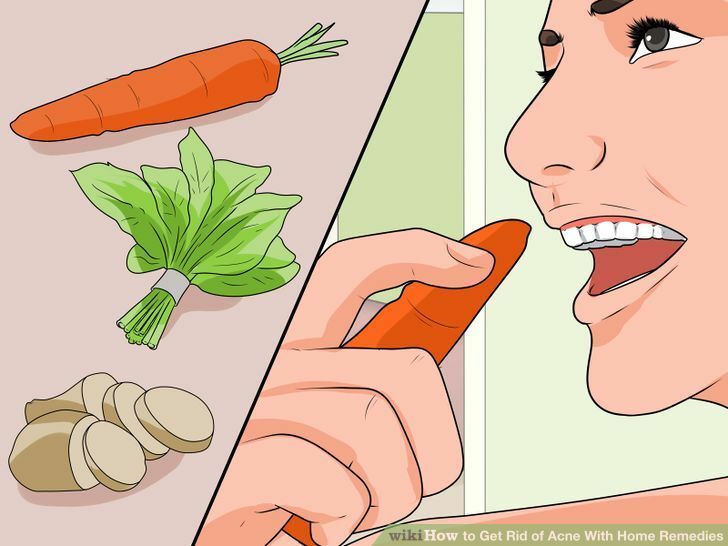 Use white toothpaste on your acne. Toothpaste is a common treatment option for people suffering from acne. Using white toothpaste instead of gel may be an effective treatment for your acne. Dab a tiny amount of white toothpaste onto the affected pimple. Mix up an aspirin pill paste. Aspirin contains salicylic acid, a common anti-inflammatory in many OTC acne medications. It can also exfoliate the skin and flush out dirt and bacteria. 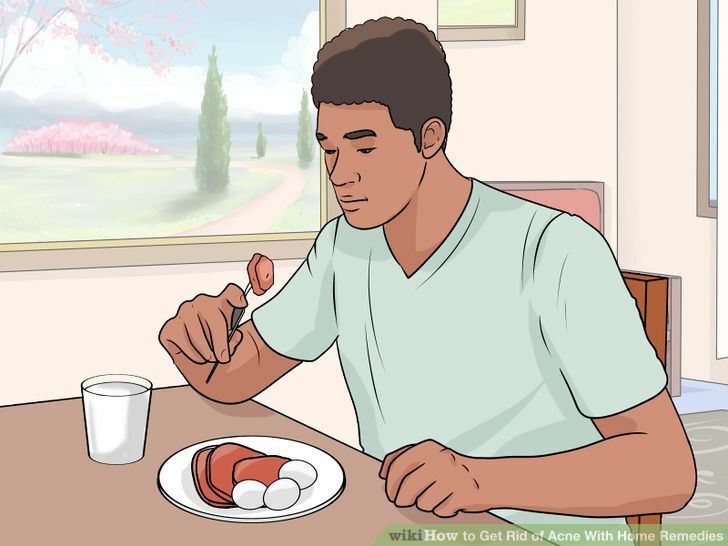 Take a low dosage of aspirin, usually 2 pills (81mg each), and place them in a bowl. Crush them into a powder. Add a few drops of water and stir until you get a paste. Apply this paste to your pimples. If your skin has any adverse reaction to the aspirin paste, rinse it off immediately and stop use. Drink plenty of water throughout the day. Water is one of your skin’s absolutely essential needs. Water flushes toxins out of your body and also improves circulation, both of which are helpful in the fight against acne. Drink water whenever you become thirsty. A good rule of thumb to use is looking at the color of your urine: if it’s mostly clear, you’ve had enough water; if it’s yellowish, aim to get more water in your diet. Eat enough good fats. While fatty foods are often considered bad for acne, there are good fats that help fight acne. Omega-3 fatty acids help keep the skin flexible, which drains sebum out of the pores. This will cut down on the oil that is associated with acne. For good fats, eat nuts, cold-water fish, and avocados. Include proteins in your diet. The body uses the amino acids from protein to produce collagen. This nutrient helps keep the skin healthy and hydrated. Good sources of protein include seafood, poultry, dairy products, and eggs, as well as beans and soy. Eat vitamin A. This particular vitamin helps cut down on the oil your skin produces. Good sources include sweet potato, carrots, dark green vegetables, and sweet peppers. Cut artificial sugars out of your diet. Sugar stimulates levels of insulin in your blood, which can in turn increase the amount of oil your skin produces. Limit your intake of junk foods and soft drinks to cut the amount of sugar in your system. Reduce your stress level. Scientific evidence finds a correlation between a high stress level and acne breakouts. The same cells that make sebum, which is the oily substance that gives you acne, have receptors for stress hormones. This can lead to breakouts when you’re feeling overwhelmed. There are a multitude of activities you can use to cut your stress, which is beneficial for your health overall. Meditation. Spend just a few minutes a day sitting with your eyes closed and focusing on your breathing. This will help your body and mind unwind, reducing your stress levels and hopefully cutting down on your acne. Listen to music. 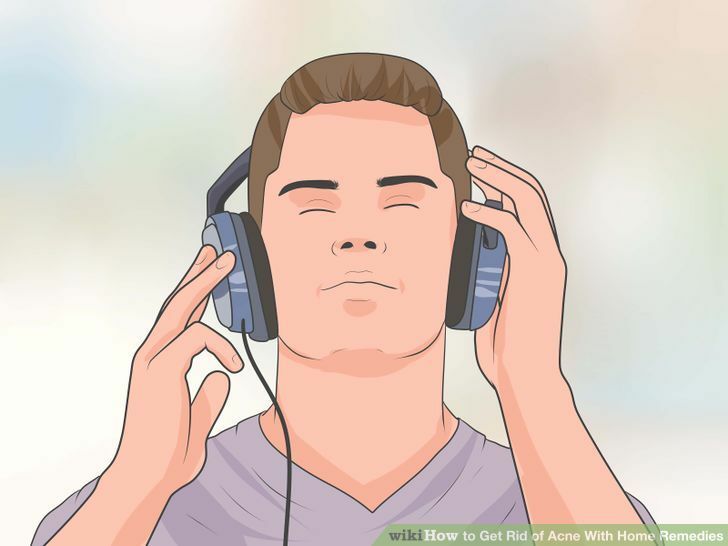 While soothing music helps your body relax and stay calm, any playlist of music you enjoy can distract you from your stress and put you in a positive mood. Exercise. This will release endorphins and put you in a better mood. Even a simple walk is enough to de-stress your body and mind. Don’t bottle up your feelings. If you’re feeling overwhelmed, reach out and talk to others. This will help you work out your problems in a constructive way. Get enough sleep. Although the connection between sleep and acne is not entirely clear, most doctors agree that insufficient sleep puts you at greater risk for psychological stress. 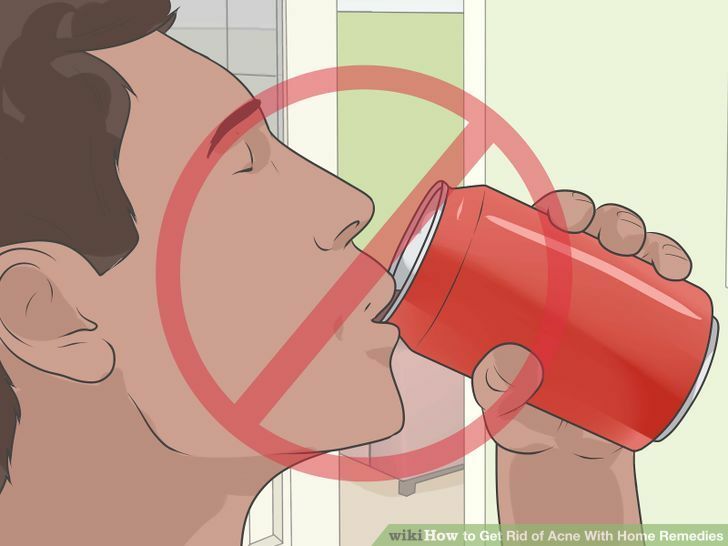 This will make your acne worse and is bad for your skin overall. Commit to getting 8 hours of sleep a night to give your skin a healthy boost. Exercise regularly. 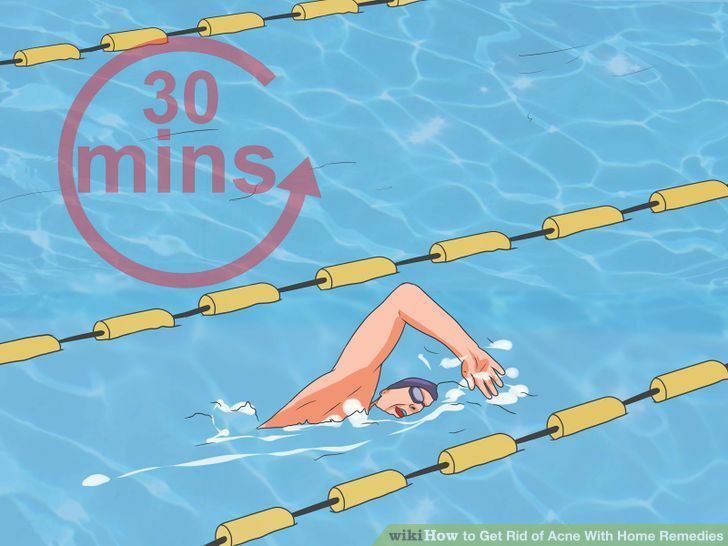 Besides reducing stress, exercise helps your acne by stimulating circulation to your skin. 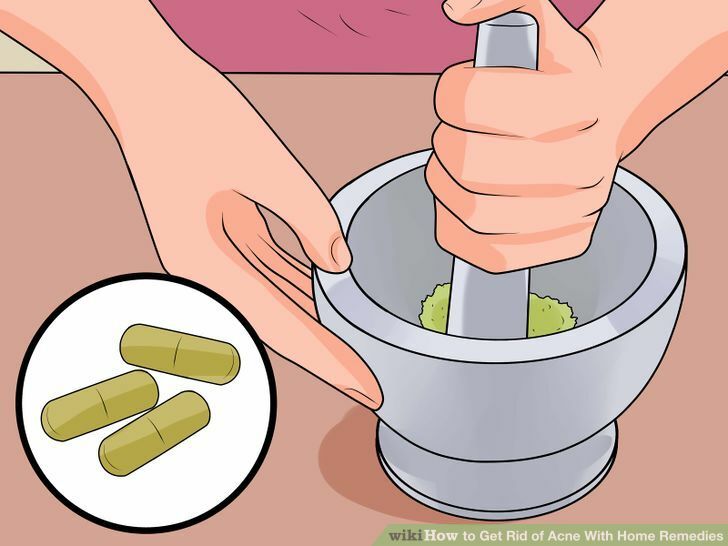 This brings essential nutrients to your skin and pulls toxins away, helping in the fight against acne. Doctors usually recommend 30-60 minutes of physical activity daily to keep yourself in healthy shape. Remember to wash your face after exercising to get sweat and dirt out of your pores. Stop using heavy cosmetics. These will clog your pores and make acne symptoms worse. Don’t get discouraged if some of these methods don’t work. 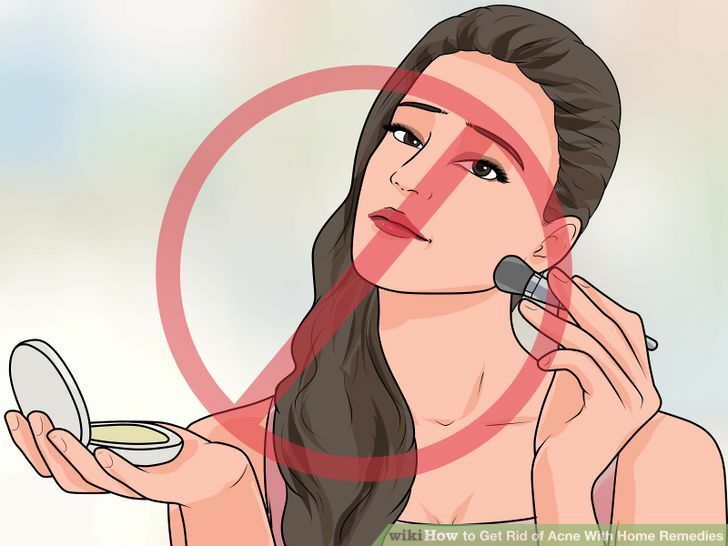 Everyone’s acne is different, and you probably just have to try a few methods before you find one that is right for you. You should check with your doctor or dermatologist before trying these remedies. You may have a specific issue with your skin that will make one or more of these treatments harmful. 10 Essential Linux Commands For Navigating Your File System Dustin Kirkland: Docker 1.10 with Fan Networking in Ubuntu 16.04, for Every Architecture! Are Pawns The Soul Of Chess?